Banjo Corporation specializes in injection molding of glass reinforced polypropylene with an excellent reputation for high quality. Key properties of glass-reinforced polypropylene include being rigid and lightweight, having excellent chemical and corrosion resistance, stress cracking resistance, low moisture absorption and high impact resistance. Banjo Liquid Handling Products specializes in injection molding of glass reinforced polypropylene with an excellent reputation for high quality. Key properties of glass-reinforced polypropylene include being rigid and lightweight, having excellent chemical and corrosion resistance, stress cracking resistance, low moisture absorption and high impact resistance. 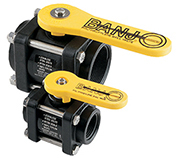 Banjo prides itself on innovative designs, skillful engineering and precise manufacturing. And no matter what the application, our innovative designs are skillfully engineered, and precisely manufactured to exacting tolerances. Our high quality products can be used for any of the below Applications. In other words, we have you covered for your Liquid Handling needs.